Manning: [after impaling henchman on exercise bench] No pain, no gain. Several years ago I essentially stopped watching Steven Seagal's new movies, because they had become unbelievably bad. However, this new film of his intrigued me because he was being paired up with Steve Austin, so I decided to give it a look. After watching it, I swear once again I will not rent any future Steven Seagal movies. 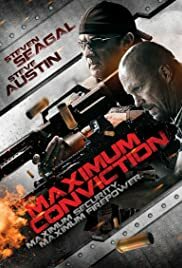 Austin is not a great actor, but he does seem to be trying - certainly a lot better than Seagal, who is awful. Seagal has gained so much weight that he waddles instead of walks, and his martial art sequences are so rapidly edited that it's clear he can't pull off multiple moves like he did with his earlier films. 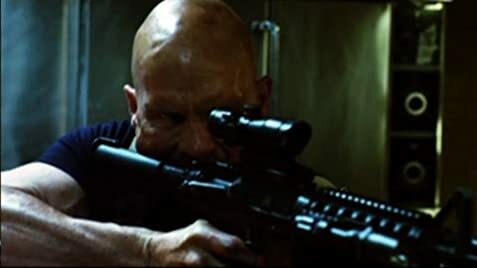 Though plenty of blame has to fall on the shoulders of director Keoni Waxman, who films the action sequences (both martial art and gun battles) in the dullest way possible, and lenses everything in unattractive and murky colors. By the way, though the DVD box seems to suggest that Seagal and Austin fight side by side, in actual fact their characters have almost no time together.